Russia’s attack jets have been active in recent days over Syria, but so have its attack helicopters. 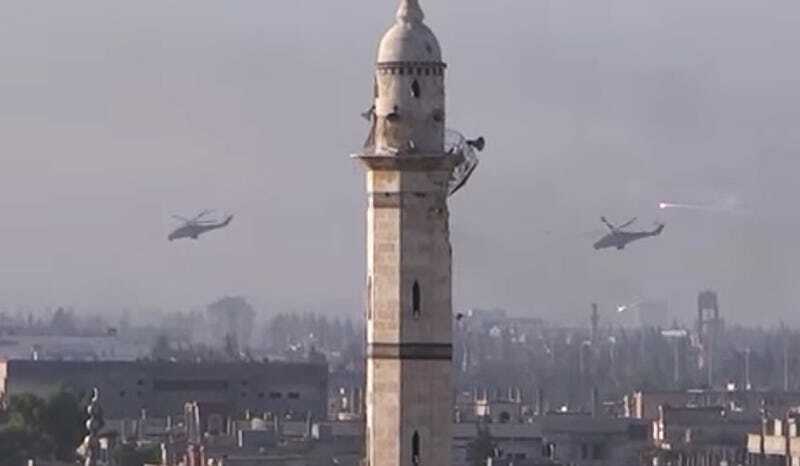 This video shows a division of Russian Mi-24P Hinds opening fire at low level over the embattled Syrian city of Homs. They fire their unguided rockets from afar, then continue to wheel around the city popping decoy flares. Low-level daytime attack helicopter operations over urban environments is not without its risks. Ground fire, or even an unseen power line could send one of these helicopters directly into the dirt. It also isn’t ideal as the enemy can often see and hear an attack coming. Still, the psychological effects of having such dangerous machines prowling low overhead can be enormous in breaking the enemy’s will to fight, or at least causing them to drastically change their tactics. Still, it is likely not a matter of if, but when, one of these helicopters falls to the ground in enemy territory.